I’ve just started a thing where I get to read and watch a whole bunch of carefully selected items in order to think, write and create around them. 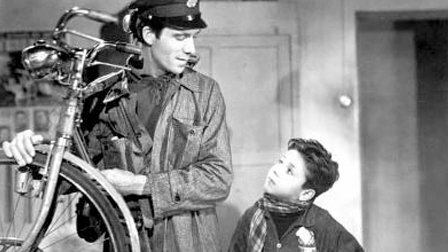 So here are some notes, not very fleshed out, about my experience of watching The Bicycle Thieves for the first time, while thinking about the concept of Realism, which, it has to be said, I haven’t fully researched yet. However, I have been thinking about the representation of truth and reality on stage, and the politics and ethics of creating, due to the projects I’ve been working on this year. What struck me immediately was the soundtrack. So, if you don’t know me already, I’m an actress and I make things, usually related to performance. I love being on film sets because I feel like a small cog in a big machine of creative production. Through my filmmaker friends, I have an inkling of all the work that goes into pre- and post-production. Having watched DVD extras of directors talking about shots, I know that it’s all a construct – all the tools available are used to make what is wanted. It’s not real. The soundtrack is emotive. You remember the experiments of screening fish with tense music and calm music. The audience read into the action vastly differing stories depending on what the music makes you feel. The aesthetics of casting: chiselled jaw workers, the masses of unemployed working classes, the tired, lean family man hero, the overweight, jolly, street-smart friend, the angelic but edgy small child. The story is set up at the start. Relationships and characters are established and we are woven into the product, the film, because the makers utilise recognisable stereotypes and signals. The science of semiotics. Think tropes. Emotions are manipulated. Tension – dramatic, textural etc. helps. An example: the scene where the jolly rehearsal music is juxtaposed with the sad reality of the players. The importance of the rehearsal vs. the importance of finding the bike. Loyalties are drawn up. Unemployment. Is this film “about” the state of affairs? Is it a “political” statement? Does the filmmaker want us to do anything? I am interested in the intent of the artist. I am also interested in the artist’s awareness of what they are making. Do we claim to be showing life realistically? Do we know that there are always multiple narratives? What then is our responsibility, if any, to the participants – viewers and those involved in the making of? i am interested in the ethics of portrayal and creation. Dramatic arcs and pacing. At the end of the film, the shots of hundreds of bikes, the stadium, the lone, unattended bike, the emphasis on tiredness, the set up of the timing of opportunity, the squeezing of time to make a decision – all this is manipulation of the viewer. Is manipulation a bad thing? All art has been carefully crafted, it’s not accidental. It’s been made to have an effect. I want to know about the gaps and maybe the tension between what the artist sets out to do, how self-aware they are, and how it’s received. What is Realism? What are the things to be mindful of when working with or experiencing Realism? OMG! What a quagmire… When we start considering ‘the real’ you could probably write 100,000 words on it and not be any closer to what it is. ‘Realism’ does not exist in my mind because it is in the first instance an imitation. And if we consider that many things in our culture are already a simulation of reality (even flavoured yoghurt – you could say strawberry yoghurt simulates the flavour of strawberries), then you have to ask, what are we imitating in the first place? Something that already is a copy? AND there is nothing real at all about performance. It’s completely made up. That’s why I tried to give up ‘acting’ in my practice (which ironically you could argue is quite Stanislavskian). So I just then started going more absurdist. Thanks, Adrian. I must find out how to get a copy. I looked up neorealism too: http://en.wikipedia.org/wiki/Italian_neorealist and found out that it’s realist in the sense that the film wasn’t shot in studios and looked at current affairs. Allan. YES. I suppose I can accept that there is a style called realism but what I do want acknowledged is that it is a construct and a choice and does not own truth more than surrealism or etc.